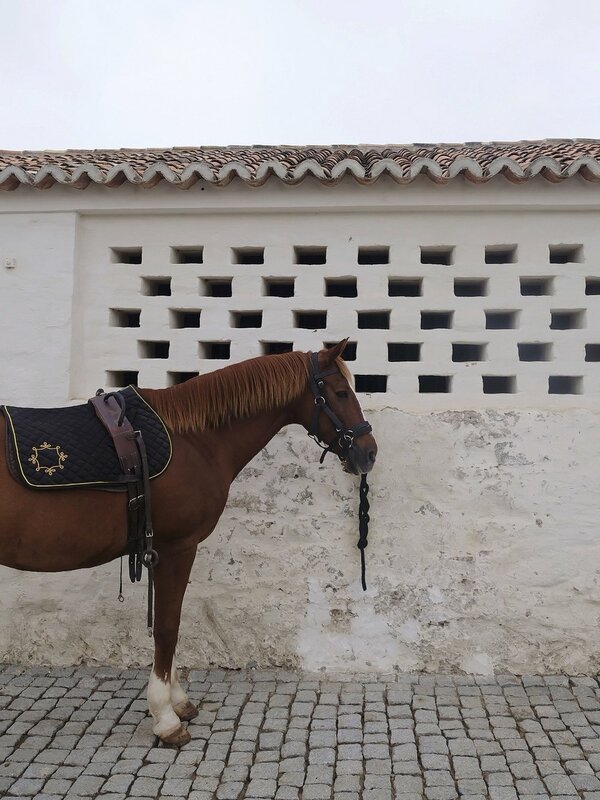 It was the last week of our trip and we took the train from Lisbon to Evora, Evora is a historic Portuguese city that is situated in the heart of the Alentejo region. This region is one of the best-preserved landscapes, and one of the least populated regions of Southern Europe. 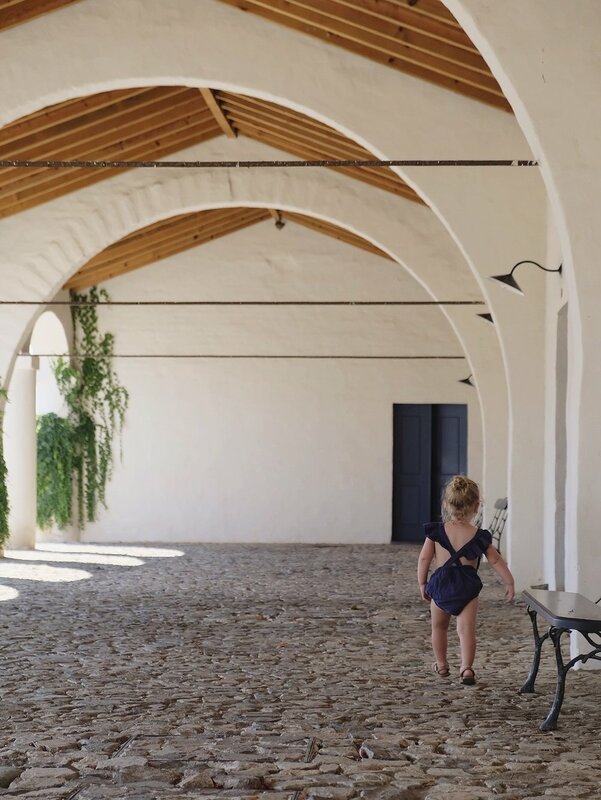 It’s close to Spain, and the sense of beauty is insane, think whitewashed villages, vineyards, and soft rolling hills with cork oaks and solitary olive trees. 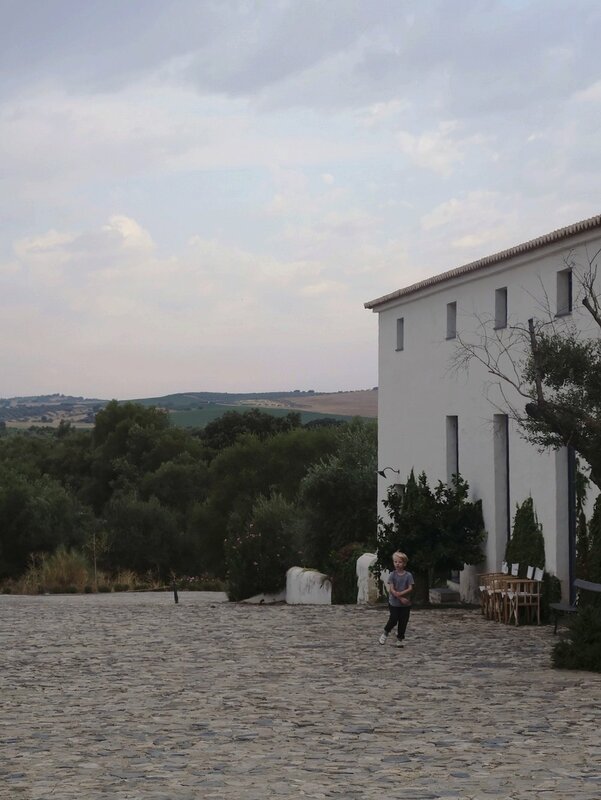 We arranged a pick up that drove us to Barrocal, which is set in the foothills of the medieval village of Monsaraz. The Monsaraz castle crowning the hill was our first view when opening the living room doors from our ‘home away from home’ for these days. The farm estate is in the same family for over 200 years, it used to be an ancient farming village. The current owner Jose Antonio Uva is from the eight generation, and he carefully renovated it back to life into this beautiful, remarkable eco-friendly hotel. While being passionate about sustainability, supporting the local community, and protecting the land, it was an ambitious project. Walking around here feels like being in a little village where everything is in perfect harmony, you can feel the ancient history all over the place but with modern comfort, a calm and understated luxury feeling, with every little detail in sync. Two restaurants on the estate, Sao Louranco do Barrocal where there is an a la carte farm to table menu, with use of seasonal and organic products. Here, they also serve the amazing breakfast. A great way to start the day, sitting at the picnic tables outside with a slower, and longer breakfast than usually with two kids. 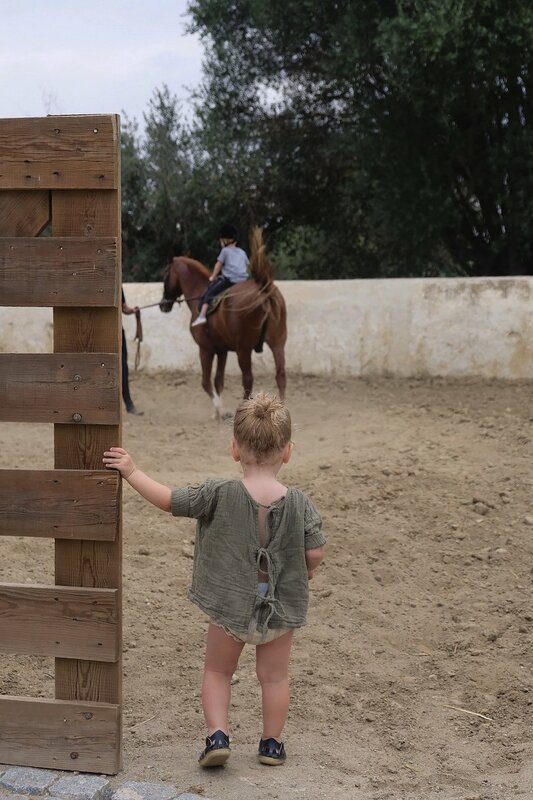 Thanks to the meadow in front of the place where they could run and play, from where they loved to watch the horses and waited until we finally finished our coffees, so we could all say hi to the horses and Jeronimo, the donkey in the stables. Jippe even got his first lesson in the ring next to the stables, riding Doutor, one of the beautiful Lusitano horses they have, and his face was priceless! This place is so perfectly kid and parent friendly, a healthy lunch served in as a possibility during nap times, or early diners for the kids in the living room, so we could eat in the restaurant later after bath and bed time. There is even a play room, a kid friendly second pool, but the best entertainment? The giant ants, the kids watched them doing their thing with a little crumb they laid down, magic. 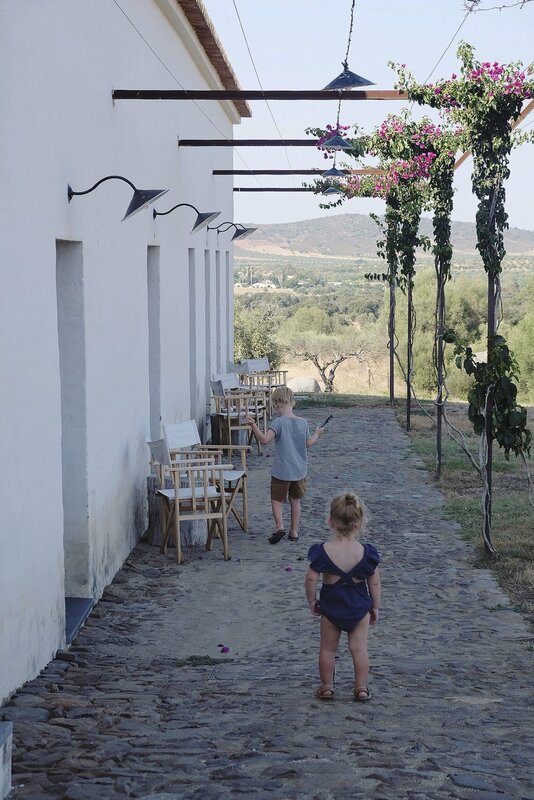 The other restaurant, Hortelao is located by the pool and the organic kitchen garden, were you can also eat those slow ‘pool break lunches’. It was here they hosted a special Summer Festival night the day we arrived, at long tables with a live jazz band playing. With fresh veggies and fish from the nearby Alqueva lake on the grill, amazing salads, deserts, and oh that wine! Although we planned to have the diner with the kids as well, plans changed after this day of traveling, and they ended up in bed already, knocked out. So, with the baby phone on, we walked the stony path in the dark along the pool towards those little lights. That’s what I call a date night! 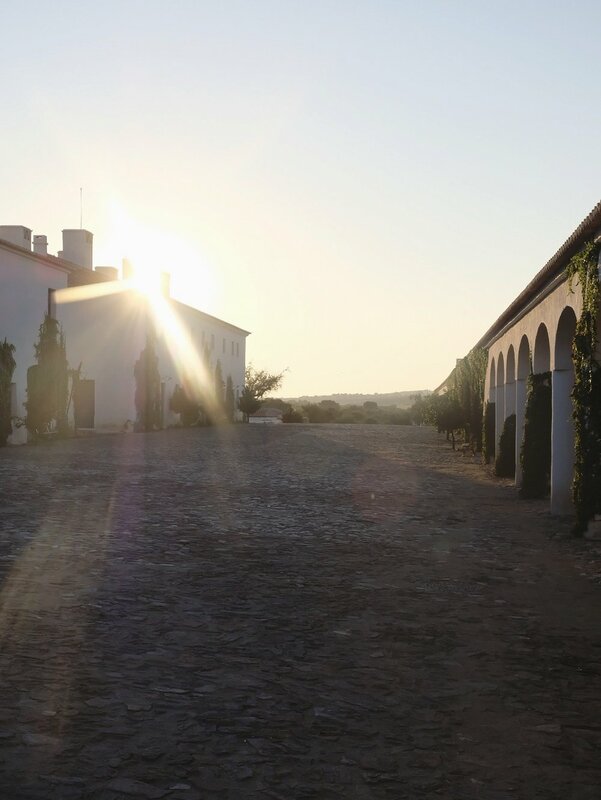 About that wine, the winery and vineyards are an important part of the hotel and the estate’s regeneration. Let’s not forget to mention another one of my personal highlights. Some me time in the spa, named after Susanne Kaufmann. The name of the women founding this skincare brand. A brand she founded on the principles she so strongly believes in: the power of nature, the importance of quality, and a commitment to sustainability. The relaxing place is so serene and based on holistic comfort. They offer a wide range of treatments, using only natural skin care products. I received an individual facial treatment. Long story short, I fell asleep, and my skin never felt so smooth before. 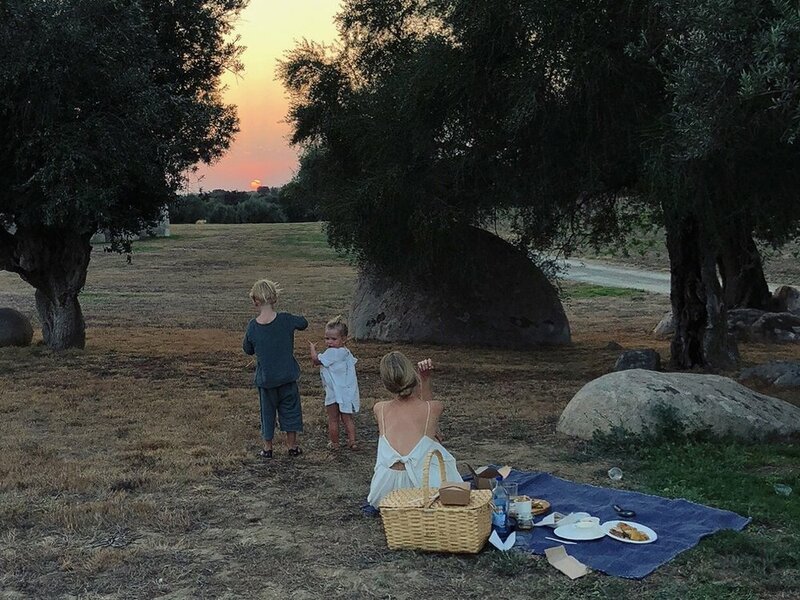 Some of these other things I want to remember… that night with a full moon, the picnic we held to see the sunset, with a big basket they prepared for us. Portugal already stole our hearts and this place made it even more intense, writing this makes me want to go back instantly. Not in August perhaps, we had extreme heat some days but I’m sure this place has its charm every season, like a fairy tale. Back to real life, or are you daydreaming yet?